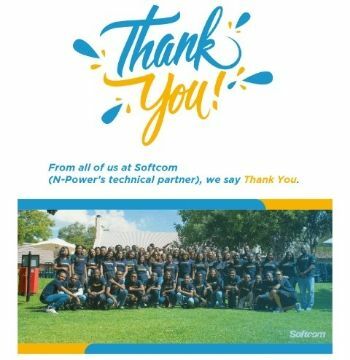 Softcom in a thank you message reveals to Npower Volunteers a new way of making money called "Eyowo". While for you it may have been a Job that N-Power meant. For us, you have been an Inspiration to our purpose and the 185 humans at Softcom whom you worked with as you went through the process of recruitment. learning, device-collection, salary payment, and support thus far. According to Softcom, we want to solve important problems in our society and very recently we discovered one we are poised to solve. 1.) Do you know only 37 million Nigerians have bank accounts today with many unable to perform the "motion! they want digitally? 2.) ATM POS Mobile Banking not available: ATM not dispensing cash, POS not working, Mobile banking not available. Do you remember when you wanted to send money to someone that really needed it but the person didn’t have a bank account? 3.) Bad Network: Have you ever been stuck before because you have money In a bank and can't access It at that time because of Network? Many more Nigerians experience the same daily but even worse. most Nigerians don't even have an account. 4.) Today over 120 million Nigerians have mobile phones and almost everyone who is of age and doesn’t have an account has a phone. All of this at a cheaper rate than you experience today and FREE when you are paying any phone number across Nigeria. so far, Eyowo has powered over 2.5 million payments to over 1 million Nigerians working with various organizations. Softcom is unveiling the Eyowo business to N-power volunteers because the thought you should be the first to know about the business before they go live for the Nigerian public. b.) Pay to any Bank: Pay any bank account instantly when you add all your AtM cards to your Eyowo wallet, you dont have to login to various bank mobile apps anymore. Very soon, Softcom will releases the Eyowo app that allows you to make money within your community and grow your own business. If you want to be part of the very first set of Nigerians who get the Eyowo app to make money within your community, please CLICK HERE.